Henry Johnson: A Tale of Courage tells the story of his life, his family, and the extensive efforts to honor his bravery and courage after his death. 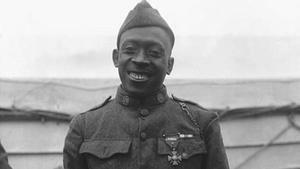 Henry Johnson was an African American U.S. Army soldier who fought heroically in the 369th Infantry Regiment of the U.S. Army in World War I. 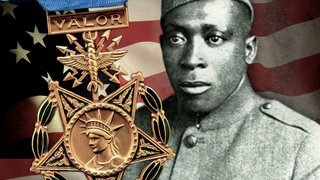 In May 1918 in the Argonne Forest of Northeast France, Johnson fought off a German raid in hand-to-hand combat, killing multiple German soldiers and rescuing a fellow soldier before fainting from the 21 wounds with which he was afflicted. Henry Johnson: A Tale of Courage tells the story of his life, his family, and the extensive efforts to honor his bravery and courage after his death. Johnson was finally honored with the Purple Heart in 1996, the Distinguished Service Cross in 2002, and the Medal of Honor in 2015. 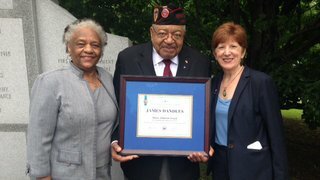 Learn more about the award and the guidelines to nominate someone you know for the 2nd Annual Henry Johnson Award for Distinguished Community Service.